Successfully Added True Star - 7 Inch HD Touch Screen GPS Navigator with ISDB-T to your Shopping Cart. Sure, this portable GPS Navigator will make life easier by getting you to your destination stress-free and on-time, but the True Star goes three steps further by providing you with free ISDB-T digital TV reception! This means hours and hours of endless high definition entertainment streamed directly to the palm of your hands and on a beautiful, high definition 7 inch touch screen! In addition, the True Star offers full audio, video, and picture playback, transforming this navigation system into an all-in-one portable media player and navigation center with Digital TV. The True Star is fully compatible with all major GPS software and is extremely simple to use. Just insert a SD card with your favorite GPS software like Tom Tom or iGO, then select the "GPS" icon from the main menu - you are now ready to start using full GPS navigation capabilities within seconds! You can even pre-load all your maps onto this device so when you enter an unknown area that lacks a GPS signal you can still find the right direction every time. GPS navigation is safe, easy and convenient with the True Star. The touch screen of the True Star is fast and responsive and produces clear vibrant images that are perfect for watching movies with. The build quality of this GPS navigator is also more than you would expect from an average hand-held media device since the True Star is built with durability in mind, giving you a fully rugged design that you can easily take with you wherever you go. Whether its exploring a new trail, hiking an unknown route, or driving to a new destination, with this unit you will get lost again. The True Star finds the perfect balance between device size and functionality. With its convenient design, robust build quality, and fully functional entertainment features, the True Star is sure to become a hot seller this coming year. Buy this product in single piece for personal use, or bulk orders for the perfect resale item. 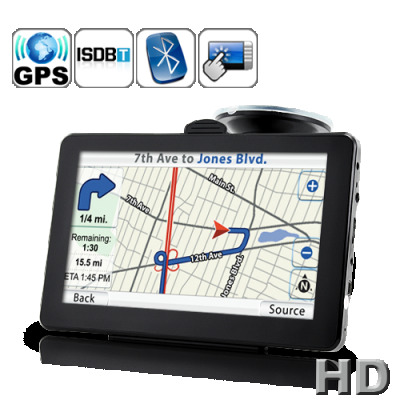 This 7 Inch HD Touch Screen GPS Navigator with ISDB-T is in stock and ready for immediate shipment. Brought to you by the leader in innovative electronics, Chinavasion! Free 4GB micro SDHC card included! Note: Actual GPS language depends on the GPS software. ISDB-T also goes by the acronym SBTVD which stands for Sistema Brasileiro de Televisão Digital. ISDB-T digital TV is for the following regions: Japan, Brazil, Peru, Argentina, Chile, Venezuela, and Ecuador. If you are in one of these countries, check local information to confirm what type of ISDB-T signals you receive: MPEG-2 or MPEG-4. This device receives MPEG-2 ISDB-T signals. Does my country support ISDB-T Digital TV? Yes! The True Star GPS Navigator comes with a 4GB micro SDHC card with GPS evaluation maps. No, the antenna is built in, so all you need to do is insert your GPS micro SD card that works best for your region and start using it straight out of the box. Want to know more about the latest in personal electronics and digital media products? Do you want to read stories regarding new products before anyone else? Then read our blog at chinavasion.com or subscribe to our RSS newsfeed to keep up with what is happening in the world of China Wholesale Electronics.